Welcome to the 384th Inspire Me Tuesday. Tons of great links last week, if you missed any you really need to go back and check them all out. Here are a few that caught my eye. Raising A Farmhouse gave her living room a refresh and it is gorgeous. I love how she shopped her house for a whole new look. Seeking Lavender Lane shared her DIY tutorial for how she made this fabulous headboard for her sofa. Don't you love this idea? I had no idea you could DIY dye leather. 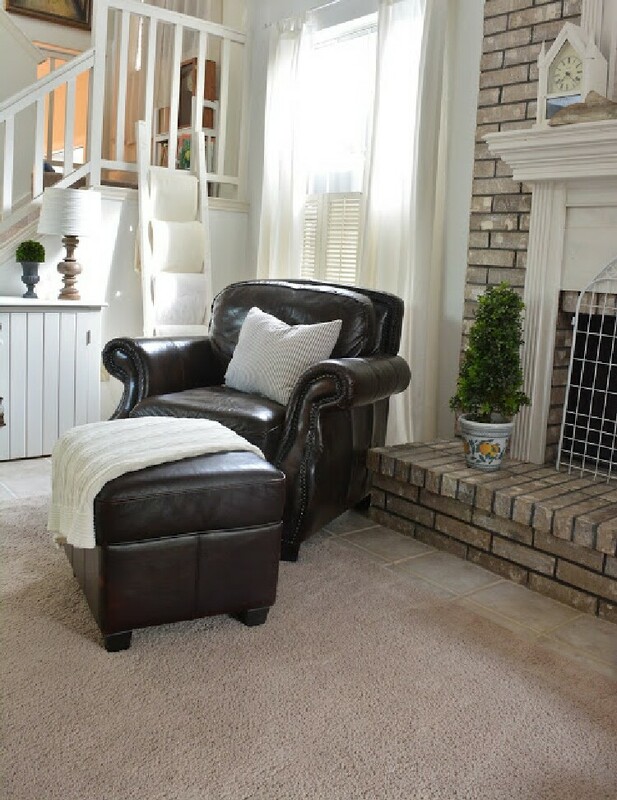 Let's Add Sprinkles shared how she dyed her ottoman to match the chair. Amazing. By adding just the right outdoor lighting, Dining Delight shared how they can use their outdoor living area at night. Isn't this the place you would want to be. 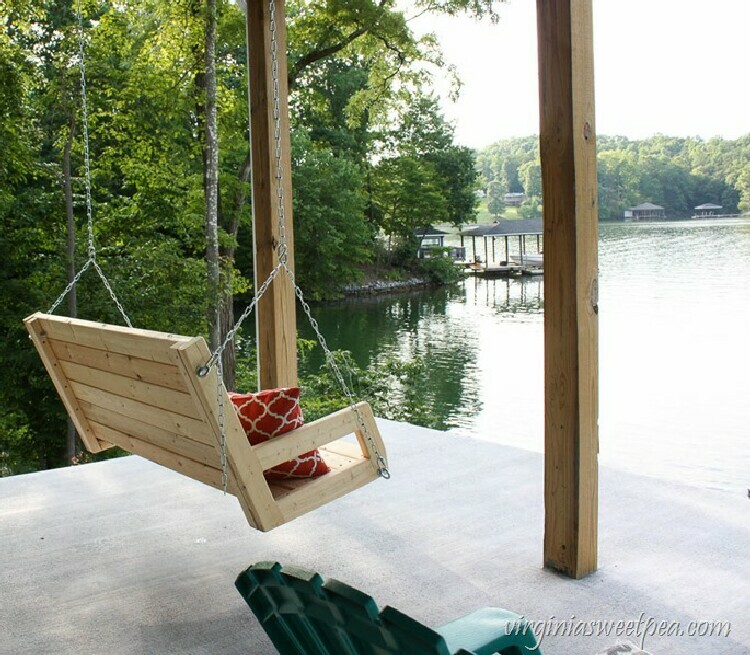 I think we all love a porch swing and if you have a view like this one, then you definitely need a swing. Sweet Pea shows us step by step how she made this one out of 2 x 4's. Thanks for the feature and for hosting. Thanks for hosting, Marty. Sweet Pea's porch swing makes me miss my porch swing. I didn't have the lake view, but I sure did enjoy my swing. Marty, thank you for hosting us. You truly are an inspiration with all you've got going on, and in the AZ heat, and still find time to style like a pro. Thanks! 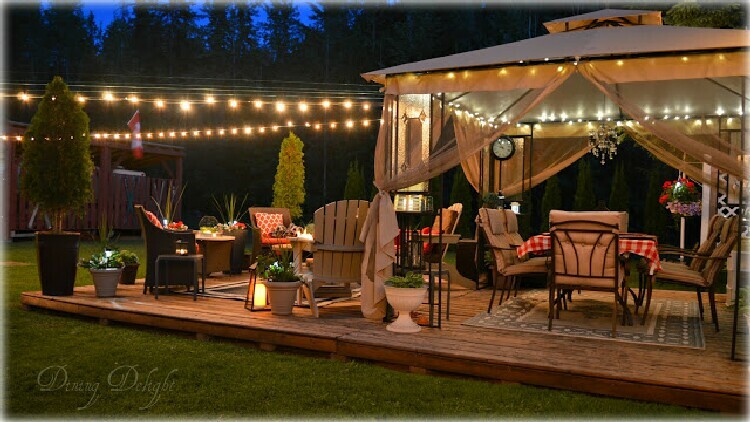 Marty, thanks so much for featuring my Summer Nights in the Backyard post! Such a thrill to be highlighted at your terrific party and I appreciate it. I haven't had much time for commenting lately but I enjoy seeing all the reno's and decorating you've been doing in your new home. Marty! Thank You. Thank You. Thank You! This makes my day to be featured with so many talented bloggers such as yourself! Thanks for hosting, and I read about your rug this morning but for some reason my work computer won't let me comment (stupid government;), the one you chose was perfect, and I dig that you chose it even tho only one person voted for it! Right on! And not sure what the mirror talk was, I didn't get that far, but I saw where someone commented about turning it vertical... and YES I agree, that would be amazing! Thanks again friend! Hi, Marty. Thanks for hosting another good link party. I enjoy meeting new bloggers through this weekly party. I also like the rug you've gotten for your sitting area. The color and texture are perfect and the new size you have ordered will make a huge difference. I have enjoyed reading about you nesting in your new home. Thanks Marty for hosting. Great features. I am constantly amazed at all you do. Thanks for the pretty party! It's fun to participate again! Thank you Marty for your 384th Inspire Me Tuesday, always appreciated. Have a good summer week ahead. Thank you so much for featuring my 2x4 swing! Thanks for the party and have a great week, Marty! Hello dear Marty! Such great features, love them all.